Because data cleaning and preparation is a critical part of a data-management processes, we want to improve OpenRefine’s connectivity by offering a seamless interface to data repositories and processing services (often API based) for non-technical users. Over the past few years with the proliferation of data available, data has become the center point for analytics, system migration or reconciliation process. However, data cleaning and preparation (which includes data normalization, duplicate removal, pivoting, joining, and splitting data) is still a major hurdle in the process and tools available for end users haven’t fully caught up. Spreadsheets offer entry level interface to the data but are time consuming and don’t scale, while programming languages offer flexibility but have a steep learning curve for the non technical person. OpenRefine addresses the growing data literacy gap by lowering the technical skills needed to normalize and prepare data. OpenRefine empowers those who understand the context in which the data are generated or used by offering them the best of both worlds with an iterative interface for data discovery and preparation and an easy-to-learn scripting language. We believe OpenRefine can be the WordPress for data processing. WordPress democratised website building for the last 15 years moving the web industry from web developers crafting pages to website assembler and editors, writing content and building a website by extending a core base with plugin and extension in a WYSIWYG interface. OpenRefine is the platform that will power this shift in the data industry by moving from developers crafting custom code for data cleaning and processing to builder of data process using connectors in a point and click interface. explore open data related to the topic; drill down to have a sense of the information available; and find nuggets of information or inconsistency gaps. clean and export the data to a format useful for his needs by doing data normalization, removing duplicates and typos, pivoting, joining and splitting columns. enrich the project by joining data sets together, processing data via an API, or working with a reconciliation service. Using Reconciliation Service to extend your data by doing fuzzy join with a remote master data source. Reconciliation helps to align taxonomy and import new information into your project. The following map lists the 16 reconciliation services and has 10 community-contributed plugins working with OpenRefine, as well as projects that have done heavy customization to add OpenRefine in their data manipulation processes. Keep improving resources for users (documentation, tutorials, training program). From inception until late 2012 the project had full time engineers working on the project while incubated by Metaweb Technologies, Inc. and Google. In October 2012 Google decided to move their engineers to other internal projects, leaving it up to the community to carry on with the project. At first, things went well. The 100% volunteer-based community got together to migrate the project from Google code to Github and prepare the 2.6 release. After 10 months, the community released the OpenRefine 2.6 beta. Since then the level of commitment started to fall preventing a final release from being made. On one side OpenRefine has a steadily growing user base and ecosystem and on the other side the stable core could benefit from an upgrade. With Qi Cui joining the project in January 2015, the 2.6 final release is now scheduled to be launched by end of 2015. OpenRefine is currently a stand-alone application with file-based input and output. 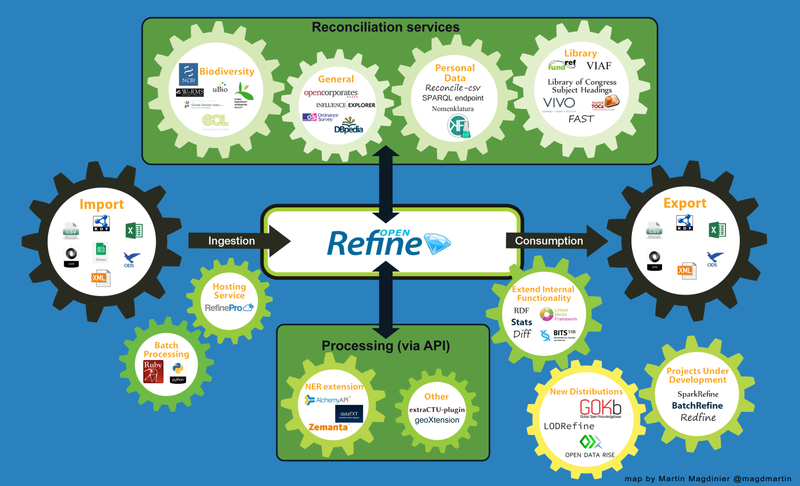 However data cleaning and preparation is always part of a larger process, so improving OpenRefine’s connection with applications, data repositories and processing services will help non technical users to integrate OpenRefine into their data workflow. easily set up and leverage reconciliation end points with their own data. reconciliation (joining and validating consistency of different data set). Our plan is to create one of each type of extension and based on our experience, and other community members’ feedback, improve the overall process (documentation, code, hooks …) for other developers. continue to develop the existing user documentation.